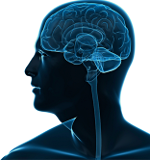 Using functional brain imaging (fMRI) a multidisciplinary team of researchers at the University of Buffalo have documented metabolic and physiologic changes in the brains of patients experiencing post-concussion symptoms. They found improvements in both imaging findings and in patient symptoms following a controlled, progressive aerobic exercise program. The results have been published in both the Journal of Head Trauma Rehabilitation and in Current Sports Medicine Reports and are summarized in UB news releases. The authors report that following concussion students often report that they can make it through the first couple of classes but end up exhausted and unable to continue through the day. When assessed for cognitive ability their speed and accuracy is often indistinguishable from subjects without concussion, leading to the inaccurate suggestion that the symptoms are psychologic and not physiologic or metabolic. Functional imaging studies of post-concussion patients showed a hypermetabolic state with altered blood flow compared to normal subjects. This explains the experience of many patients–they can still accomplish some of the same tasks, but quickly tire out. The researchers also found that patients with concussion had less activation in certain areas of the brain compared to normal subjects, such as the cerebellum, which is responsible for balance and coordination and the posterior cingulate, which is often underactive in patients with dementia. Patients who were treated with a program of graded aerobic exercise showed significant symptom improvements. Many studies have shown that premature return to exercise can interfere with recovery from concussion and that early exposure to the risk of a second concussion should be avoided. Victims of concussion should therefore consult with their physicians to insure that any program of aerobic exercise is advisable and consistent with the parameters used in UB study.